In 2015 we lost our friend and a very funny and talented cartoonist, Tim Corrigan. We here at Five Star Comics did not have an exclusive claim to him of course. Tim touched the lives of hundreds of writers, artists, readers, and fans. They remember him, too. This is a time of year for remembering. Arnie Fenner, an artist, editor, and publisher, has made a list of cartoonists, illustrators, and other artists we lost during the past year. Tim Corrigan's name is on that list, joining those of Murphy Anderson, Jon Arfstrom, Roger Bollen, Mel Crawford, Alan Kupperberg, Earl Norem, Leonard Starr, Herb Trimpe, and many others. The names of the five cartoonists murdered in Paris in January are on the list as well. You can read Mr. Fenner's list on a posting called "In Memoriam 2015" on the website Muddy Colors: A Fantasy Art Collection, December 28, 2015, here. Goodbye to 2015 and to Tim Corrigan, too. The Silver Bridge came down on this date in 1967. Forty-six people died because of it, on the bridge and in the waters of the Ohio River. Even now, in the area of Point Pleasant and across the river in Gallipolis, Ohio, there are people who remember the disaster or knew or are related to someone who died there. Novelist, poet, essayist, and book collector Jack Matthews was born in Columbus, Ohio, but had roots in Gallia County, of which Gallipolis is the seat of government. (His father was born on a Gallia County farm.) I don't know that Jack Matthews knew or was related to anyone who died in the Silver Bridge disaster, but he took on the identity of a fictional survivor in his novel Beyond the Bridge, from 1970. 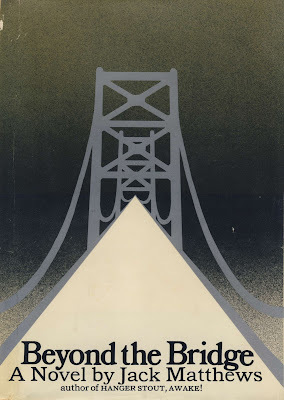 Beyond the Bridge is brief but dense and complex, a much different book than Matthews' first novel, Hanger Stout, Awake! (1967), which is more a song of innocence than of experience. 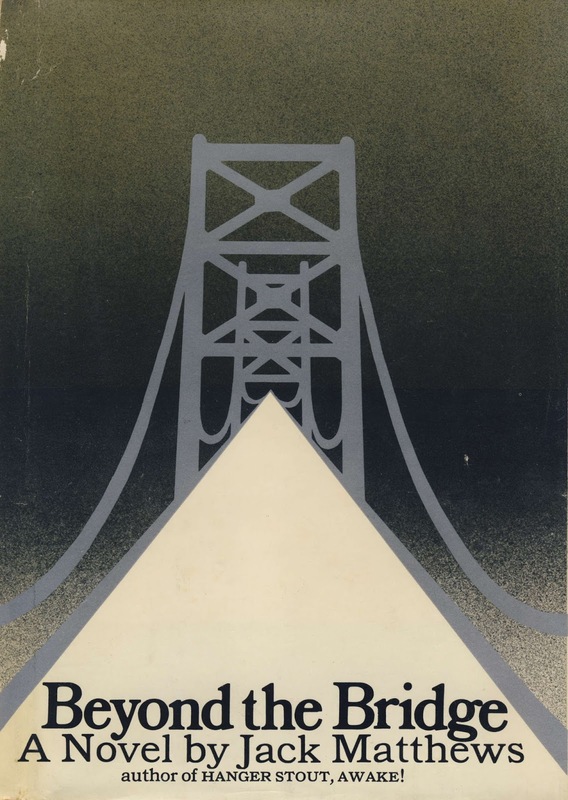 Beyond the Bridge takes the form of a diary of a man who has put his old life behind him and assumed a new one on the other side of the river--beyond the bridge--in West Virginia. The book ends with an entry for July 18, 1968--four days before Jack Matthews' forty-third birthday--as the protagonist sets out to cross another bridge and begin another diary. Jack Matthews lived for another forty-five years and passed away on November 28, 2013. Only before we went to sleep, I myself wondered why I should be so interested in these silly superstitions and Harlan's insane theology. I like to think that those who are gone still have a voice, even if it's one we can no longer hear. But if Jack Matthews' only remaining voice for us--whether we are vast seas or merely islands of readership--is in his books, then I must share the feeling of his diarist, that of being "close to people who have long been dead, and have no other voice left." His books speak, have the breath of life in them, and, though their author has been gone two years now, still live. In memory of Jack Matthews and the forty-six people who died on December 15, 1967. As it turns out, Jessica has exhibited in Lafayette, Indiana, next door to where Terence went to college. As they say, it's a small world. Forty-six people died when the Silver Bridge collapsed on December 15, 1967. Among them was a cartoonist who was about to begin a new life. His name was Thomas Allen Cantrell, and he came into the world on November 3, 1941, in Gallipolis, Ohio. His parents were Owen and June (Hartley) Cantrell. A younger brother, William Owen Cantrell, was born on October 2, 1944. Thomas Cantrell went to school in Gallipolis and graduated from Gallia Academy High School in 1960. He joined the U.S. Navy and served for a time at Great Lakes Naval Training Station, north of Chicago, Illinois. Cantrell worked in his hometown for the Ohio Publishing Company, publishers of the Gallipolis Tribune, and lived at 325 Fourth Avenue. He was a member of the First Baptist Church of Gallipolis. By about rush hour on December 15, 1967, Cantrell had delivered a load of newspapers from Gallipolis to Point Pleasant and was on his way back home when the bridge fell. His vehicle went into the water with scores of others. Unlike so many who died that day, he was not found until months later, on May 12, 1968. The forty-third of forty-six bodies recovered from the disaster, his was pulled from the Ohio River at Clipper Mills, Ohio, across from Gallipolis Ferry, West Virginia. Cantrell's delivery of a load of newspapers from Gallipolis to Point Pleasant was to be his last job of the day on the day the Silver Bridge fell. December 15, 1967, was to be his last day on the job. 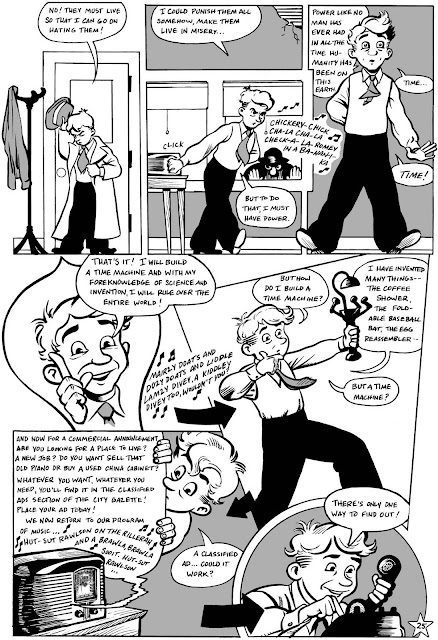 Not long past his twenty-sixth birthday, Thomas Cantrell was going to California to work as a cartoonist. Instead, his dream died with him, and he was buried at Mound Hill Cemetery in the city of his birth. We as cartoonists remember him. Gary Gibeaut has dedicated the first issue of his Mothman comic book to Thomas Allen Cantrell, a fellow local cartoonist, and to Tim Corrigan. The Five Star crew had their best shows ever at the fourteenth annual Mothman Festival, which took place on Saturday, September 19 and Sunday, Sept. 20, 2015, in Point Pleasant, West Virgina. Larry Blake, Gary Gibeaut, Jay Gibeaut, Terence Hanley, and Matt Marshall had tables this year at the festival. They all had a mix of new and old merchandise, including Jay and Larry's newest collection of Mothman 'Toons. Everything we had sold well, as the crowds this year seemed bigger than last year and the weather was good both days. For 2015, Gary Gibeaut had new poster designs and a new comic book, a single-character issue called simply Mothman. Gary's new book has two complete stories. The first, "This Mysterious Entity! This . . . Mothman," explores one possible origin of the eponymous creature. The second, "The Abridged Mothman," begins with the story of the first sighting of Mothman but then segues into the fall of the Silver Bridge and the artist's response to the events of the 1960s, in his childhood and now in adulthood. 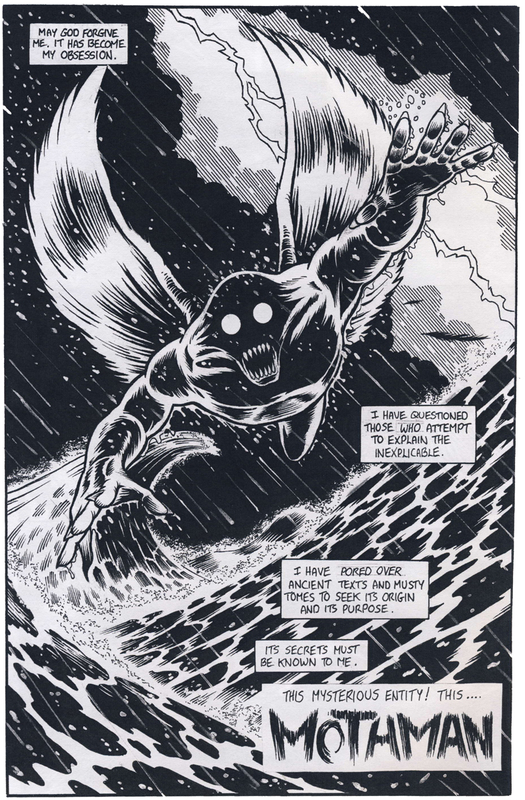 Gary dedicated Mothman to Tim Corrigan, who passed away on August 22, 2015, and to Thomas Allen Cantrell, a fellow cartoonist who perished in the cold waters of the Ohio River on December 15, 1967. Like we said, everything we had sold well at this year's Mothman Festival. That includes Gary Gibeaut's Mothman comic book. In fact it sold out. Look for a second printing in 2016. 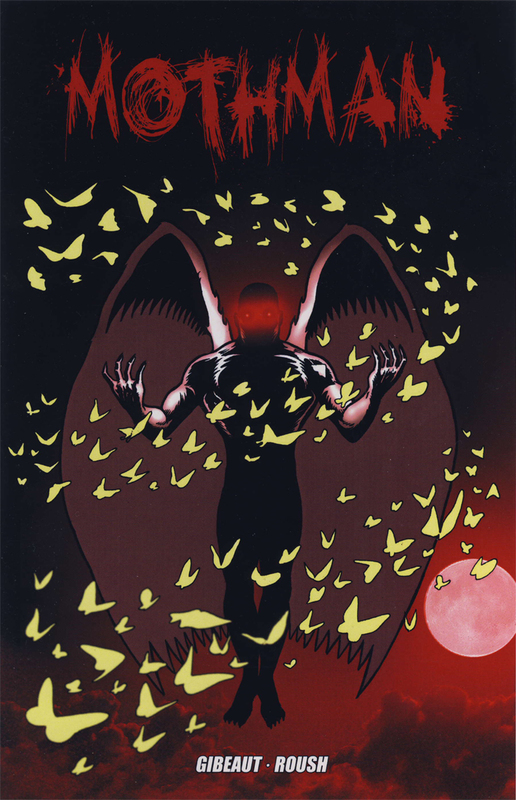 The cover of Gary Gibeaut's Mothman comic book, with coloring and effects by Jason Roush. And the splash panel from the same book. Tim Corrigan has died and words fail us. He was a cartoonist, sign-painter, writer, editor, teacher, songwriter, and musician. More importantly he was a husband, a father, and a friend. Born on December 2, 1950, Tim began drawing comics as a child as so many of us did and still do. "As a little kid I didn't have the drawing skills to handle human characters with all those complicated arms and legs," Tim remembered, "so one of my first efforts was a super-powered worm--Elasticworm!" Will Eisner said that a cartoonist is a problem-solver. Tim Corrigan demonstrated that an early age with his limbless cartoon hero. Tim began collecting comics in earnest when he was a teenager. Soon he discovered fandom and began contributing to comic book fanzines. In the early 1970s he became involved in independent comics, a community in which he eventually became a leader. That community grew more interconnected in the 1980s with Tim's publication of a magazine called Small Press Comics Explosion or SPCE. "The purpose of SPCE," Tim wrote, "was to provide a central point where people making and marketing their own comics could get together, meet each other, and buy, sell or trade their publications." In time, SPCE had five hundred subscribers, no small feat for a small press title. (The term small press was his invention.) Tim also published comics under his own New Voice Media imprint. His titles included Tim Corrigan's Superhero Comics, Kiwanni, Final Man, Mightyguy, and Tim Corrigan's Comics & Stories. For his efforts, Tim Corrigan received a Lifetime Achievement Award from the Small Press and Alternative Comics Expo--S.P.A.C.E.--in 2006. In 2008, Tim started a new chapter in his career by writing and inking a Sunday comic strip called Allegheny Man. Larry Blake, penciler on the strip during its four-year run, explained: "It was supposed to be impossible to self-syndicate a comic strip, to do an adventure strip, and on top of that a superhero strip, but we broke all the rules!" Tim retired from comics in 2012 and took up music as a family affair. The Corrigans--Tim with his wife Carol--made records and videos. You can see some of their performances and hear some of their songs on YouTube. The Corrigans' sons--Nate and Matt--are artists and musicians as well. Tim Corrigan died on August 22, 2015. He was sixty-four years old. In 2008 he wrote, "[I]t seems I have had a wonderful life." We're glad of that and glad that we knew him. We wish he could have stayed longer. Earlier this year, the vendors who had purchased tables for the Small Press and Alternative Comics Expo found out that the regular venue, the Ramada Plaza Hotel in Columbus, Ohio, had closed suddenly and unexpectedly and that S.P.A.C.E. was being rescheduled for summer. That was bad news for some who were planning to go to the show in the spring. It turned out to be good news for others who wouldn't have been able to make it on the original dates. Not having enough time is the way most artists live. Having more than enough time is a new experience. I'm surprised we knew what to do. A rescheduled show. A new and never-tested venue. A scramble among artists to see whether they could make it or not. Changes to everyone's plans. There were reasons to doubt that S.P.A.C.E. would come off well this year. But it did. Really well by our estimate. And for that, Bob Corby, the organizer, and his staff should be praised and commended. Next year, there might even be a statue of Bob in front of the Northland Performing Arts Center in Columbus, the location of this year's show. Larry Blake and Terence Hanley were among the artists at this year's S.P.A.C.E., which took place on Saturday, July 18 and Sunday, July 19, 2015. Larry was in the main room, a vast, dark, noisy, and crowded place that used to be a department store. His table sat catacorner from that of Harvey Pekar's widow, Joyce Brabner. Terence was in a kind of annex, a small, brightly colored room off to the side of the main room but on the way to the vending machines and restrooms. For one reason or another, everyone at the show had to go through the small room and past his table. There was also food for sale by outside vendors, and you had to go outside to get it, either in the extreme heat on Saturday or a hurricane-like rainstorm that came through on Sunday afternoon. Also mentioned in Copy This! is Michael Neno's enigmatic Where Is Document No. 30?, a mini-sized comic that's worth the dollar you have to part with in order to get it. Speaking of digests, D. Blake Werts is on the staff of a new digest-sized magazine called The Digest Enthusiast. The title is accurate: The Digest Enthusiast includes articles about digest magazines and comic books, plus interviews with and profiles on the people who have worked in these little magazines. In a welcome development, the Enthusiast also publishes illustrated short fiction. And to round things out nicely, Michael Neno has had his work in the two issues published to date. The Digest Enthusiast is available at the website of Larque Press, here. For Larry and Terence, this year's S.P.A.C.E. ended with quick repairs to their car, made in a deserted parking lot, with a piece of rubber gasket and a hose clamp. Then it was home for a little rest before beginning preparations for the next show. Myron Slurve is an inventor. He is also a misanthrope. He is the latter because humanity doesn't appreciate his accomplishments as the former. (Also because women don't. Or maybe mostly because women don't.) His crowning achievement is a machine that projects a ray by which people and things can travel through time. He has also invented the coffee shower, the foldable baseball bat, and the egg reassembler. That all happened in the mid-1940s. Only now has science caught up with Myron. Only now have scientists uncracked the code on how to un-boil a hard-boiled egg. You can read more in a story called "Scientists Crack the Code on How to Un-Boil a Hard-Boiled Egg" by Liz Neporent at the website of ABC News (Jan. 26, 2015), here. Too late for Myron Slurve, his idea could lead to new ways to fight cancer.